Delivers 26 Highway MPG and 20 City MPG! This Chevrolet Blazer delivers a Gas V6 3.6L/ engine powering this Automatic transmission. WHEELS, 18 (45.7 CM) BRIGHT SILVER ALUMINUM (STD), UNIVERSAL HOME REMOTE includes garage door opener, programmable, TRANSMISSION, 9-SPEED AUTOMATIC, ELECTRONICALLY-CONTROLLED with overdrive, includes Driver Shift Control (STD). *This Chevrolet Blazer Comes Equipped with These Options *CONVENIENCE AND DRIVER CONFIDENCE PACKAGE includes (BTV) Remote Start, (KA1) driver and front passenger heated seats, (UG1) Universal Home Remote, (TB5) power programmable liftgate, (V59) roof-mounted side rails, (UKC) Lane Change Alert with Side Blind Zone Alert, (UFG) Rear Cross Traffic Alert, (UD7) Rear Park Assist, (DD8) auto-dimming inside rearview mirror and (DM8) auto-dimming outside heated power-adjustable manual-folding body-color mirrors with turn signal indicators , TIRES, P235/65R18 ALL-SEASON BLACKWALL (STD), SILVER ICE METALLIC, SEATS, HEATED DRIVER AND FRONT PASSENGER, SEATS, FRONT BUCKET (STD), ROOF RAILS, BLACK, REMOTE START, REAR PARK ASSIST WITH AUDIBLE WARNING, REAR CROSS TRAFFIC ALERT, PREFERRED EQUIPMENT GROUP includes Standard Equipment. * Stop By Today *A short visit to Stingray Chevrolet located at 2002 N Frontage Rd, Plant City, FL 33563 can get you a reliable Blazer today! Scores 26 Highway MPG and 20 City MPG! This Chevrolet Blazer delivers a Gas V6 3.6L/ engine powering this Automatic transmission. WHEELS, 20 (50.8 CM) TRANSIT, USB DATA PORTS, 2, ONE TYPE-A AND ONE TYPE-C includes SD Card Reader, auxiliary input jack, located within front center storage bin, TRANSMISSION, 9-SPEED AUTOMATIC, ELECTRONICALLY-CONTROLLED with overdrive, includes Driver Shift Control (STD). * This Chevrolet Blazer Features the Following Options *SOUND & TECHNOLOGY PACKAGE includes (IOT) Chevrolet Infotainment 3 Premium system with connected Navigation and 8 diagonal HD color touchscreen, (UQA) Bose premium 8-speaker system, 4.2 display with infotainment connectivity, (MCR) 2 USB data ports with SD Card Reader, located within front center storage bin, (UV2) HD Surround Vision, (DRZ) Rear Camera Mirror and (KI6) 120-volt power outlet , TIRES, P235/55R20 ALL-SEASON BLACKWALL, SEATS, FRONT BUCKET (STD), REAR CAMERA MIRROR, PREFERRED EQUIPMENT GROUP includes Standard Equipment, POWER OUTLET, 120-VOLT located on rear of front center console, LPO, 20 (50.8 CM) GLOSS BLACK ALUMINUM WHEELS includes (SKL) transit wheels and (QNU) P235/55R20 all-season blackwall tires, JET BLACK, PERFORATED LEATHER-APPOINTED SEAT TRIM, HD SURROUND VISION, ENGINE, 3.6L V6, SIDI, DOHC WITH VARIABLE VALVE TIMING (VVT) and Active Fuel Management with Stop/Start (305 hp [227 kW] @ 6600 rpm, 269 lb-ft of torque [365 N-m] @ 5000 rpm) (STD). 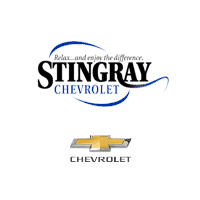 * Visit Us Today *A short visit to Stingray Chevrolet located at 2002 N Frontage Rd, Plant City, FL 33563 can get you a tried-and-true Blazer today! Boasts 26 Highway MPG and 20 City MPG! This Chevrolet Blazer boasts a Gas V6 3.6L/ engine powering this Automatic transmission. WIRELESS CHARGING, WHEELS, 20 (50.8 CM) DARK ANDROID MACHINED-FACE ALUMINUM (STD), TRANSMISSION, 9-SPEED AUTOMATIC, ELECTRONICALLY-CONTROLLED with overdrive, includes Driver Shift Control (STD). * This Chevrolet Blazer Features the Following Options *ENHANCED CONVENIENCE AND DRIVER CONFIDENCE II PACKAGE includes (IOT) Chevrolet Infotainment 3 Premium system with connected Navigation and 8 diagonal HD color touchscreen, (UQA) Bose premium 8-speaker system, (AAB) memory settings, (K4C) Wireless Charging, (KA6) rear outboard heated seats, (KU9) driver and front passenger ventilated seats, (N38) power tilt and telescoping steering column, (UV2) HD Surround Vision, (DRZ) Rear Camera Mirror, (KSG) Adaptive Cruise Control - Advanced, (UGN) Forward Automatic Braking, (UKJ) Front Pedestrian Braking, (UHX) Lane Keep Assist with Lane Departure Warning, (UE4) Following Distance Indicator, (UEU) Forward Collision Alert, (HS1) Safety Alert Seat and (TQ5) IntelliBeam headlamps , TIRES, P235/55R20 ALL-SEASON BLACKWALL (STD), SUMMIT WHITE, STEERING COLUMN, POWER TILT AND TELESCOPING, SEATS, VENTILATED DRIVER AND FRONT PASSENGER, SEATS, HEATED, REAR OUTBOARD SEATING POSITIONS, SEATS, FRONT BUCKET (STD), SAFETY ALERT SEAT, RS PREFERRED EQUIPMENT GROUP Includes Standard Equipment, REAR CAMERA MIRROR. * Stop By Today *A short visit to Stingray Chevrolet located at 2002 N Frontage Rd, Plant City, FL 33563 can get you a dependable Blazer today! Scores 26 Highway MPG and 20 City MPG! This Chevrolet Blazer boasts a Gas V6 3.6L/ engine powering this Automatic transmission. WIRELESS CHARGING, WHEELS, 21 (53.3 CM) GLOSS BLACK ALUMINUM, TRANSMISSION, 9-SPEED AUTOMATIC, ELECTRONICALLY-CONTROLLED with overdrive, includes Driver Shift Control (STD). *This Chevrolet Blazer Comes Equipped with These Options *SUN AND WHEELS PACKAGE (Includes (C3U) Panoramic power sunroof, (RQM) 21 Gloss Black aluminum wheels and (R0V) 21 all-season blackwall tires. ), ENHANCED CONVENIENCE AND DRIVER CONFIDENCE II PACKAGE includes (IOT) Chevrolet Infotainment 3 Premium system with connected Navigation and 8 diagonal HD color touchscreen, (UQA) Bose premium 8-speaker system, (AAB) memory settings, (K4C) Wireless Charging, (KA6) rear outboard heated seats, (KU9) driver and front passenger ventilated seats, (N38) power tilt and telescoping steering column, (UV2) HD Surround Vision, (DRZ) Rear Camera Mirror, (KSG) Adaptive Cruise Control - Advanced, (UGN) Forward Automatic Braking, (UKJ) Front Pedestrian Braking, (UHX) Lane Keep Assist with Lane Departure Warning, (UE4) Following Distance Indicator, (UEU) Forward Collision Alert, (HS1) Safety Alert Seat and (TQ5) IntelliBeam headlamps , TIRES, P265/45R21 ALL-SEASON BLACKWALL, SUNROOF, POWER PANORAMIC, TILT-SLIDING WITH POWER SUNSHADE, STEERING COLUMN, POWER TILT AND TELESCOPING, SEATS, VENTILATED DRIVER AND FRONT PASSENGER, SEATS, HEATED, REAR OUTBOARD SEATING POSITIONS, SEATS, FRONT BUCKET (STD), SAFETY ALERT SEAT, RS PREFERRED EQUIPMENT GROUP Includes Standard Equipment. * Stop By Today *Stop by Stingray Chevrolet located at 2002 N Frontage Rd, Plant City, FL 33563 for a quick visit and a great vehicle!